Game #11 – Can You Take Me High Enough? 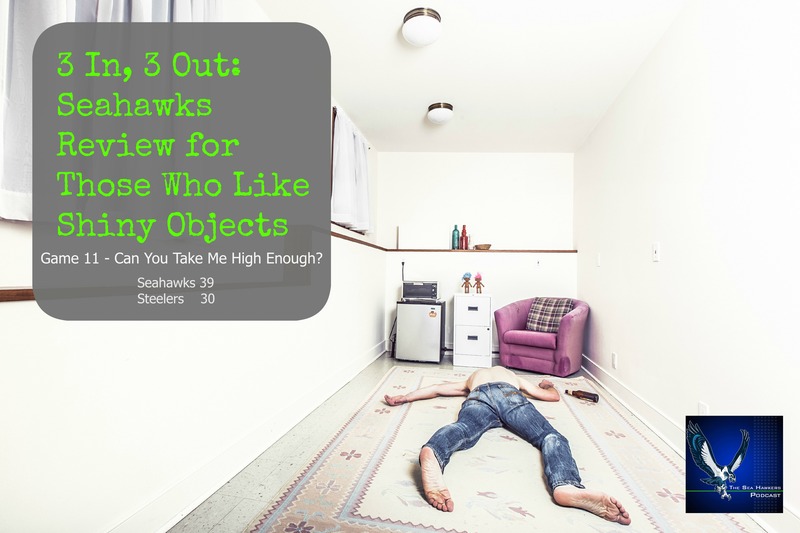 3 In, 3 Out is a concise, yet somewhat satisfying recap of 3 things that went well for the Seahawks and 3 things that ummmm… didn’t. The coverage will go deeper than the average bear – for instance this will be the only mention of our birthday boy tossing 5 TDs on our way to a ‘Hawks victory! Not bad, for a celebrity QB. Hey, we crush this guy when we’re stagnant, so I think we owe him some kudos when we are electric. Some of this was pure execution. Jimmy with huge 3rd down conversions. Angry Doug just going off. The O-Line providing the ‘pocket-thingy’ fairly consistently. But a lot of this was scheme and exceptionally designed plays. When Bevell has a nice play design it makes me wonder if anything I believe is real. Is Pizza even good? Is smiling nice? Dang. This one hurts. Anyone suggesting otherwise is wrong. We’re not better without him, so just stop. On the last Sea Hawkers Podcast – Adam broke down many of things Jimmy was doing that opened things up for teammates while correctly pointing out Jimmy was on pace for a very solid season. 70 receptions and 880 yards receiving (the pace he was on) for a Seahawks TE, on a team ranked #1 in the league rushing the ball… yeah, he will be missed. This doesn’t mean we won’t win without him. This doesn’t mean Luke Willson can’t step in and do good things – we know he can. Let’s just not happy-talk this one to death. Jimmy, get well and here’s to a clean rehab from a tough injury. We’ll see you in ‘16. Revisionist history of our 2013 & 2014 Seahawks would have you believe that we were never in trouble. Never gave up big yardage, and won every game 43 – 8. Yet I remember Sherman basically ending Matt Schaub’s Texan career by stealing that early season game. I recall Kam extinguishing the Carolina flame with a tremendous route-jump pick 6! And Earl’s “Karate come from the heart” chop of destiny that prevented a Rams TD in what was a tight contest in late December of last year. A HOF QB threw the ball 55 times. He has really good WRs. Yes, they gained a ton of yards and yes at times, they sliced us up pretty darn good. But, we also picked off Big Ben twice. One coming from a DT. We had 4 INTs in total. Lane made a critical ‘special teams’ play remaining disciplined and ascending at the exact right moment. Welcome back @StayingInMyLane. Avril (aka Godzilla) registered his 7.5 sack of the year. Frank the Tank got to Big Ben too. DeAngleo Williams rushed for a mere 29 yards. Is our D as good as years past? At this point, no. We can’t lie to ourselves. Did our D come up with a handful of huge plays against a really good offense? Yes. A fade route to our rookie WR Kevin Smith. An incredibly predictable run to Rawls. Que lastima. Our 2-pt. conversion approach is abysmal. As much praise as Bevell received above, well he’s gotta take some heat here. I would say let’s just kick the extra point no matter what, but for the 2nd week in a row I find myself instead saying – let’s not talk about that!!! Moving on. There I sat shaping my leftover mashed potatoes into the shape of the Lombardi Trophy as I witnessed our team convert huge 3rd down, after huge 3rd down. As @hawkblogger aptly pointed out on Twitter: This was the first time since 2013 that the Seahawks topped 50% in 3rd down conversions in back-to-back tilts. Furthermore, this marked the only time the Seahawks converted five 3rd downs of 10+ yards in any game. *Note – that particular stat only went back to 1994, but still! While we can’t rely on this type of conversion kind for every game, it sure was enjoyable to watch this time around. Out – Referee Analysts There to Analyze… Referees. Wow. That was by far the most fun game of the year. But now our ‘Hawks are off to the land of 10,000 lakes to face a very competent, if not thrilling, Vikings team. What will I be looking for? Rawls to outrush Adrian. Plain and simple. I don’t believe this game will be shoot-out-ish because I just don’t think the Vikings will throw the ball 59 times. Are we walking into this game the same way we felt walking into the Cardinals game a few weeks ago? We know how that one turned out, so to our beloved Seahawks we ask: Can you take us high enough?? ?